This post, written by Alex Mazer, originally appeared on Medium on January 17, 2016. The 2016 Toronto budget process is now well underway. This is a budget that is shaping up to be different, for one thing because it started off not with a balanced budget, as is the usual practice, but with a gap. A big gap. 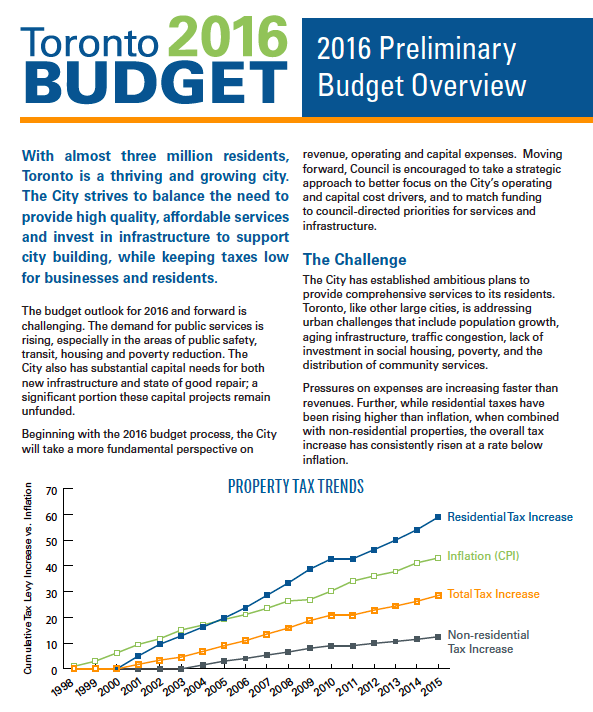 The gulf between aspiration and actual dollars, laid plain by city staff in the launch of this year’s budget, is huge. 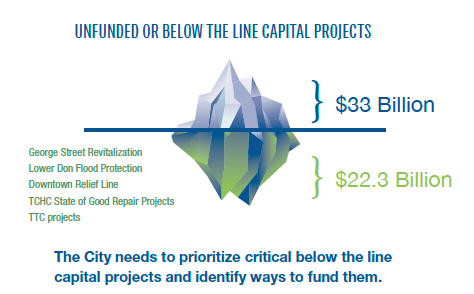 There are over $22 billion (about twice the city’s annual operating budget) in unfunded capital projects, including $2.7 billion in TTC-board approved projects, $1.7 billion in public housing repairs, the “downtown relief line,” and the city’s share of SmartTrack. The operating shortfall is also big: nearly $70 million in previously identified priorities, including spending to fight poverty, open the subway early on Sunday, and make public housing repairs recommended by the mayor’s task force on the Toronto Community Housing Corporation. There has been some debate about the merits of presenting an “unbalanced” budget. The Toronto Star’s editorial board has projected an “acrimonious,” “chaotic” budget process this year, in contrast to the approach to the “smoother” process of presenting a balanced budget, initiated under the Miller administration. A number of people, myself included, have criticized the practice of framing the Toronto budget in terms of a gap that must be closed, the trend over the past several years, because it gives the misleading impression that the city’s spending is out of control. This year, though, starting out the budget with a gap is a refreshing dose of honesty. It is forcing attention towards the stuff that matters: which of Council’s political priorities get implemented, and how we pay for the ones that are unfunded. This is a welcome change from previous budgets where debate has focused on weirdly small items. This year’s gap does not feel like a political trick. It feels more like an earnest attempt — driven, it would appear, from the bureaucratic not the political level — to inject some truth and strategic focus into the budget process. The gap that is being framed up is not any old gap. It is between (a) available dollars and (b) expressed major priorities of elected officials. The best civil service advice focuses elected officials not just on options, but on the most important decisions. The traditional budget — presented as balanced — is arguably more chaotic and less guided than the process here, because it does not point decision makers to the most important choices, and it is less transparent about the decisions underlying the proposed budget. This year’s framing has provoked widely divergent reactions from councillors, as illustrated in this Toronto Sun article. For Mike Layton, the gap is a reason for a serious conversation about revenue tools. For newly elected councillor Justin Di Ciano, it is a reason for better information about the value for money and performance of existing programs and services: “We have no idea how effective each dollar we put into the system is,” Di Ciano says. We need both. What the gap makes clear, and what everyone can agree on, is that our fast-growing city can’t finance its future without some fundamental fiscal changes. It’s not about tinkering, nor is it about a one-time injection of cash from the federal or provincial governments, though both levels have a role to play, especially the new federal government. So this year’s budget is off to a chaotic but well-framed start. How to we make the most of it, so that the process doesn’t deteriorate into the usual incrementalist, short-term, nickel-and-dime approach? What big capital programs should be funded? What new taxes and other new revenue sources are preferable? What programs and services could be made more effective? Public engagement should not be based on open-ended, broad questions, but should rather give residents digestable and understandable lists of real options that the city is considering. Why not use online tools, which could include tools from customized providers such as Open North — a Canadian civic tech firm that specializes in city budgeting and public participation — or even general survey tools like Survey Monkey? A bigger step could include a public referendum on revenue tools for transit. A 1% sales tax — Toronto is too dependent on property taxes as a revenue source. The city is exposed in the event of a major correction in the real estate market, which many people now see as a real possibility. We need to diversify. According to Shelley Carroll, an additional 1% sales tax (a 14% rather than a 13% HST) in Toronto would net the city $500 million per year, which could be allocated to transit or other capital projects. Value-added taxes, such as the HST, are economically efficient and can be made progressive with the right rebates for lower-income people (like the GST/HST rebates). A progressive property tax system — The current system is highly regressive, the opposite of income tax. A progressive property tax would tie taxation more closely to ability to pay, increasing revenues and reducing wealth inequality. In a recent op-ed, Ryerson professor Myer Siemiatycki proposes a version of this, in which higher property tax rates would be applied to homes of greater value. A number of people are still fighting to restore the right decision on this major transit issue. Doing so would make a big dent in the capital shortfall. In an earlier piece for Torontoist before this year’s budget launched, I called from a reframing of the budget debate to focus not just on the residential property tax rate, but on broader issues of (1) priorities — what activities does the budget prioritize? (2) outcomes — what results does it hope to achieve and how is it tracking against existing goals? (3) performance — how effective is the city as an organization? This year’s more honest budget framing clearly accomplishes the first goal, focusing the debate on the big stuff. But there is an opportunity to focus more on (2) and (3) — outcomes and performance. Both are part of what could be called an “effective government” agenda. Such an agenda would be a natural for Mayor Tory, who has a background in business leadership and who campaigned on a modern, functional City Hall. Higher quality data/evidence/information to inform decisions, using tools such as cost-benefit analysis, benchmarking, and other appraisals to assess the performance of programs and services. Some ideas about how more evidence-based budgeting could be incorporated into Toronto’s process are included in Better Budget TO’s review of the 2015 budget process. Bloomberg Philanthropies’ What Works Cities initiative is a useful example of this kind of reform at the US level. More professional, consolidated management and governance of public assets, both financial (e.g., pension funds, reserves) and non-financial (e.g., real estate)— this needn’t mean privatization, which can be a poorly executed and expensive wealth transfer at the expense of the public, but it does mean a more consistent focus on value creation and a separation between asset management and policy making / regulation. Dag Detter and Stefan Fölster’s recent book, the Public Wealth of Nations, includes some useful international examples of better public asset management rooted in the Swedish experience but spanning several continents. An effective government agenda is a long-term, forward-looking agenda. It is very different than a “slash and burn” or “across-the-board cuts” approach. It is not about rooting out “waste” and breaches of process: it takes the forward-looking view of a skillful manager, engineer, or architect, not the backward-looking, compliance-oriented view of an auditor — a view that dominates far too much of the debate about public sector performance (the right approach usually involves fewer rules, not more). It is a process of continuous improvement and value for money, carefully targeted to those areas of greatest opportunity. In some ways it is the opposite of the across-the-board “efficiencies” (really budget cuts) approach the city has taken over the past several years. Given the size of the gap that city staff have laudably identified, we are going need an “all of the above” (to borrow a phrase from President Obama’s energy policy) approach to better budgeting: one that includes revenue, real spending choices, and more effective government, all informed by meaningful public input.